Jávea - lies about 80 km north east of Alicante, in between Denia and Altea. Javea, between Denia in the north and the cabo de nao in the south, is embedded between two bays - the cabo San Antonio and the cabo San Martin. In the old part of Javea there are still some traditionally built houses with balconies remaining. Especially along the Avenida del Mediterraneo which runs along the Javea harbor area, you will find many restaurants and bars. From a sightseeing point of view, you should visit the church Iglesia de San Bartolome, which was built in the 12th century. Also of interest is the museum Soler Blasco, which can be found in the calle Primicias. The Hotel is situated in the beautiful city of Jávea to the north of the Costa Blanca and is bathed by the waters of the Mediterranean. It provides the ideal location for water sports and is surrounded by a vast sea that rivals the beauty of the hotel garden filled with palm trees, bougainvilleas and other tropical plants surrounding the magnificent swimming pool. Lush green vegetation outlines the brilliant colours and refreshes the sunny summer afternoons. The interior provides the traveller with the opportunity to relax in spacious, comfortable bedrooms with balconies overlooking the Mediterranean sea. The hotel’s main rooms are light, spacious, and comfortable and are decorated with plants and flowers. Fish, seafood and rice combine with garden produce to make truly exquisite dishes such as paella de pato con pimientos rojos (duck paella with red peppers) and paella de verduras de temporada (paella with seasonal vegetables). Unmissable. Regional citrus fruits, oranges and 'manda inas' are also exceptional. Benicarló is a city and municipality in the north of the province of Castelló de la Plana, part of the Valencian Country, in the Mediterranean Coast between the cities of Vinaròs and Peníscola, not too far south from the Ebre River. Tourism, agriculture and some manufacturing are the major industries. Well communicated with a train station in the Valencia-Barcelona line and the A7 Highway. Main Holidays: Artichoke Fair in January, Falles in March, St. Gregory in May, St. Bart in August. Popular as a holiday-resort for Northern Europeans and Spaniards alike. 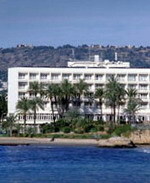 The magnificent Costa del Azahar compliments the hotel's splendid gardens, situated 30 metres from the sea. The hotel's interior contains classic contemporary furniture, and the architecture is the same throughout. Enjoy a round of golf in the fresh sea air. Rice, fish and sea food dishes are the basics of Mediterranean cuisine. Seafood dishes and the Benicarló artichokes capture the region's culinary character. Sign up for the breakfast buffet; it is one of the Parador's culinary treats. Also you have to try the seafood and rice dishes. After all, you are in Levante. Also during July and August, you can enjoy the cocktail bar/barbeque, which of course has the same quality and service as the Parador. Valencia - a medium-sized port city (the third largest city in Spain) and industrial area on the Costa del Azahar in Spain. It is the capital of the Autonomous Community of Valencia and of province of Valencia. Valencia has a Mediterranean climate, with warm dry summers and mild winters. The ancient winding streets of the Barrio del Carmen contain buildings dating to Roman and Arabic times. The Cathedral, built between the 13th and 15th century, is primarily of gothic style but contains elements of baroque and Romanesque architecture. Beside the Cathedral is the gothic Basilica of the Virgin (Basílica De La Virgen De Los Desamparados). The 15th century Serrano and Quart towers are part of what was once the wall surrounding the city. 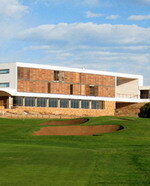 A must for golf lovers thanks to the 18-hole golf course, the Hotel is seen as one of the best in the world. The large comfortable rooms - some with sea views - are an invite to relaxation. Located on the coast, there is also a fantastic SPA to relax, an outdoor pool and a grass football pitch. The completely renovated and new plan building strictly respects the natural setting with its grand glass-dominated structure bringing guests closer to La Albufera Nature Reserve from all indoor spaces. The lower floor houses a modern conference and events room - the ‘Vela Latina’ - with a maximum 400 pax capacity that may be split into 5 spaces. This means it may be tailored to suit any requirement. There’s nothing like a good paella ... We recommend you try the Parador’s star dish: paella. You may also choose from other local rice dishes. As you know, rice is king here!